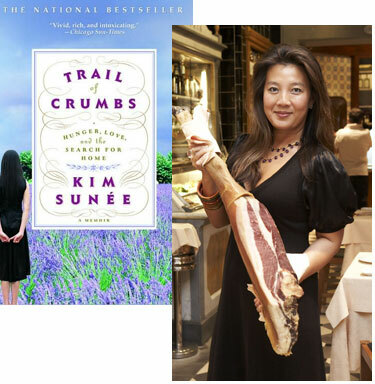 I first met Kim Sunée last year at the Pulpwood Queens book festival, where her memoir, Trail of Crumbs: Hunger, Love, and the Search for Home, was a big hit with the book club members of East Texas. She’s made a lot of other fans along the way—and in this essay, she tells how she found one of her first, at a crucial moment in the book’s path to publication. I had turned in the final draft of my manuscript and was about to board a plane to Paris when my editor called informing me that the next step before my book could be published was acquiring blurbs. I felt sick to my stomach. Blurbs. I had heard from other first-time authors about how a line or two of praise from a famous author could make or break how a bookseller perceives you or if a reviewer will even take a second look at your advance copy among the hundreds she receives each week. Most of my Paris trip was spent retesting recipes for the book by day and tossing at night trying to figure out who to ask and how to approach them. I didn’t know anyone famous enough to help me as a first-time author. My French writer friends didn’t understand the emphasis placed on a quote from another writer. “Doesn’t the book speak for itself?” they would ask while pouring me another glass of wine. How could I explain that in Amérique, we were obsessed with what others thought and that an advance copy without substantial blurbs was the sign of a book with a very short shelf life? I left Paris convinced that no one would blurb me. A few days later, I went to Key West on assignment and, over drinks with the French chef, discovered that he had spent time in Michigan and Wisconsin. Jim Harrison’s name came up. I read Jim Harrison’s work, mainly his poetry, as a 15 year-old writing student in New Orleans. After ten years living and eating in France, and now that I was a food editor, I had come to also love Harrison’s The Raw and The Cooked: Adventures of a Roving Gourmand. It is one of those books I carry with me and give to people I hope will become lifelong friends. Offering up the book is a way of gauging how close we can really be. If someone truly doesn’t appreciate Harrison’s love of chicken thighs or isn’t struck by the last lines of “Heart Food in L.A.,” then I know it may be a rocky road ahead for our friendship. After my visit with the Key West chef, who gave me Jim’s contact information only after I swore on a pound of fresh foie gras not to give it to anyone else, I wrote Mr. Harrison a letter introducing myself. I told him I was a first-time author in search of blurbs, and that he was on my dream list. Jim wrote a letter back saying that he only has “one eye and doesn’t read manuscripts anymore but if my book was about food and love and travel” that he would give it a go. My editor’s brilliant assistant sent Harrison a large-print version of the manuscript—about 600 pages. 2 weeks later he sent in the blurb to my editor. Dear Kim, All my life I’ve wanted to own a ham and now, in my old age, it has come true. He went on to write that the gift reminded him of the film Jamón, Jamón and so he named his ham Penelope (after the actress Penélope Cruz). I’d get updates on how Penélope was faring, in the cassoulet or a nice long-simmered soup. The ham would last the entire month. Harrison’s blurb would be attached to my book forever. In the end, both of our dreams came true.